For all its grandeur, the Big Apple isn't the only city in New York State. Far from it. Hundreds of great communities call the Empire State “home,” including Rochester—America’s original boom town. 1. Businessman and Colonel Nathaniel Rochester is hailed as the city’s founder. 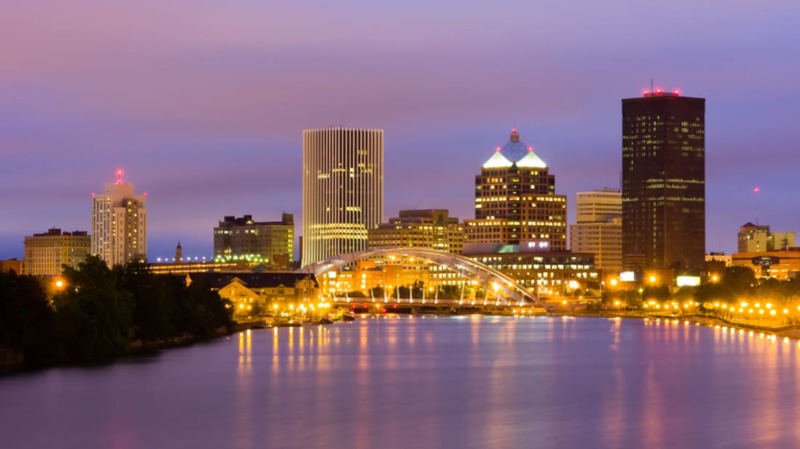 In 1817, it was officially incorporated under the name “Rochesterville,” which was shortened to plain “Rochester” five years later. 2. Today, Rochester is known as both “Flour City” and the “Flower City.” These nicknames arose in the early-to-mid 1800s, when the town boasted both a thriving mill industry and profitable seed trade. 3. Throughout western New York, grade schoolers learn the cautionary tale of Sam Patch. A daring showman, Patch leapt his way into fame and fortune. Between 1827 and 1829, he dazzled crowds by jumping off bridges, buildings, and boat riggings. Among his many feats, the greatest by far was a successful, death-defying hop over the edge of Niagara Falls in October 1829. Alas, Patch’s career came to an abrupt end the very next month. On November 6, he attempted to leap down Genesee Falls, which bisects Rochester. Patch succeeded, but was dissatisfied by the paltry tips his onlookers provided. So, he repeated the stunt nine days later—and this time, he perished. 4. One of America’s snowiest cities, Rochester gets hit with a median annual average of 89.3 inches. You’ve been warned. 5. Frederick Douglass moved to Flour City in 1872, where he’d remain for 25 years. The abolitionist’s grave now overlooks Rochester’s skyline at Mt. Hope cemetery. 6. On any list of famous Rochesterians, Susan B. Anthony deserves top billing. In 1872, local authorities arrested her for attempting to vote illegally, prompting a trial in which she delivered what was perhaps the single most influential women’s suffrage speech of all time. Ultimately, the court slapped her with a $100 fine—which Anthony never paid. Her home of four decades on Madison Street is now a National Historic Landmark. 7. Xerox was founded there in 1906 as the “Haloid Photographic Company.” Initially a manufacturer of photographic paper and equipment, it emerged as a juggernaut in the copier trade during the 1960s. 8. With all due respect to Xerox, Kodak is—by far—Rochester’s most famous corporate resident (prior to 2005, it was also the city’s biggest employer). Innovator extraordinaire George Eastman launched the company in 1892. Among his many inventions was the word “Kodak” itself. Eastman rather liked the letter “k,” which he described as “strong” and “incisive.” Thusly inspired, he coined “Kodak”—a memorable but meaningless term—and had it trademarked in 1888. 9. When Neil Armstrong walked on the moon, it was specially-designed Kodak film that captured the moment. Furthermore, in recognition for its outstanding contributions to cinema, the Rochester-based company has won nine Academy Awards. 10. Sports historians cite the Rochester Red Wings as minor league baseball’s oldest continually-operating franchise. Dating back to 1899, the storied club also has the distinction of having lost the longest professional baseball game ever played. On April 18, 1981, the Wings took the field against Pawtucket’s Red Sox in northern Rhode Island. After 32 gridlocked innings, the contest was put on hold at 4:09 a.m. the next morning. This epic showdown remained officially tied until the teams next met on June 23. Then, at long last, Pawtucket scored the winning run at the bottom of inning number 33. 11. Philadelphia has cheesesteaks and Boston’s got clam chowder, but what’s Rochester’s signature dish? A hangover-busting delight affectionately called “the garbage plate.” Several variations exist, with the most popular consisting of hash browns, macaroni, hamburger patties (or, sometimes, sliced hot dogs), ground beef, melted cheese, Italian bread, and hot sauce all strewn together into a haphazard pile. Trust us, they’re worth going up a few pant sizes for. 12. Regional entrées also include the beloved white hot. German-American residents invented these pork-based hot dogs during the 1920s as an economical alternative to the more expensive red ones. 13. Joe Simon—the co-creator of Captain America—grew up in Rochester. Following his high school graduation, he worked as a cartoonist and illustrator for the Rochester Evening Journal and Rochester Sunday American. Later on, Simon would move to the Big Apple, where he’d conceive “Cap” with comic book pioneer Jack Kirby. 14. Speaking of Marvel, parts of The Amazing Spider-Man 2 were filmed in Rochester. For one chase scene that involved an enraged, plutonium-touting Paul Giamatti, East Main Street stood in for Manhattan, complete with 59th and Broadway street signs. Masses of local actors were hired as extras. 15. Mohandas Gandhi’s grandson Arun Gandhi currently calls the Flour City home. Along with his wife Sunanda, Arun founded the M.K. Gandhi Institute for Nonviolence, an organization dedicated to promoting racial justice, environmental sustainability, and peaceful community-building. Created in Memphis, Tennessee, the non-profit is now a part of Rochester’s Plymouth-Exchange neighborhood. 16. Established in 1895, the Rochester Marshmallow Company was the very first American business to mass-produce these fluffy, roast-able treats. 17. Live animals can make for dangerous mascots. Thankfully, the Rochester Institute of Technology took no chances with “Spirit”: a tiger cub who briefly helped rile up the crowds at school athletic contests. In 1963, she was purchased by students for the sum of $1000. Between highly-supervised visits to campus proper, Spirit lived at the nearby Seneca Park Zoo. When it became clear that she’d soon grow too big for these excursions, Spirit was kept at the zoo permanently. Tragically, the big cat died of an incurable genetic defect in October 1964. 18. Drop by for a visit, and you’ll notice an abundance of colorful horse statues on public display all over town. In a 2001 effort to raise money for local charities, artists painted over 100 life-sized bronco sculptures. Sponsored by companies from across the metropolitan area, these horses were decked out in all manner of trappings—from tutus to braces to udders—before being auctioned off and scattered. 19. The NBA’s Sacramento Kings originally played in western New York as the Rochester Royals. Here, the franchise won its only league championship to date by defeating the N.Y. Knicks in the 1951 finals. Despite this victory, the Royals left for Cincinnati after the 1956-57 season. Over the next few decades, they’d set up shop in Kansas City and Omaha before settling down in California’s capital. 20. An ill-fated Flower City subway system started transporting residents in 1927, only to close within a mere 29 years of existence. Urban explorers have since converted the abandoned tunnels into ornate graffiti and mural galleries. Every October, interested parties can take a peek at part of this (literal) underground art scene on a tour led by the Canal Society of New York State. 21. Since 2002, the National Toy Hall of Fame has been headquartered at the Strong National Museum of Play in downtown Rochester. So far, 59 games, dolls, and other playthings have been inducted—including G.I. Joe, checkers, and the cardboard box. To nominate a toy for the 2016 induction process, go here. 22. Located in the Rochester suburb of Pittsford, Oak Hill Country Club presents a real challenge for golfers—Tiger Woods himself once called it the “hardest, fairest” course he’d ever played. So far, five stroke play championships have taken place there, in which a combined total of only 10 players were under par. 23. Think you’ve got what it takes to be an Arthurian knight? Head over to E-Z Industrial Park, where a fake sword conspicuously protrudes from the side of a boulder. 24. Another local park has a decidedly spookier claim to fame. Legend has it that the ruins of an old dining hall in Durand-Eastman Park were once the home of a prominent woman whose daughter vanished under mysterious circumstances. Every so often, somebody reportedly sights the grieving parent’s ghost, usually with her two faithful dogs in tow. To Rochesterians, she’s known as “the lady in white”—so named for the pale dresses she supposedly dons. 25. In 2014, a Rochester crowd set an unorthodox Guinness World Record. Clad in purple, pink, and green ponchos, some 2297 people came together to form the largest human flower of all time. Fittingly, this went down at the Lilac Festival, an annual event in which up to 500,000 people get to check out over 200 types of blossoms, trees, and shrubs. Flower City, indeed.